With the talent and depth in the US team, picking teams to go to the Olympics or World Championships is often difficult and complicated. But after the 2013 National Championships, I think this team is pretty straight forward. Let’s start with who has been selected to come to the World Championship selection camp. Simone Biles of Spring, Texas/Bannon’s Gymnastix, Kennedy Baker, Flower Mound, Texas/Texas Dreams; Brenna Dowell, Odessa, Mo./GAGE; Peyton Ernst, Coppell, Texas/Texas Dreams; McKayla Maroney, Long Beach, Calif./All-Olympia; Maggie Nichols, Little Canada, Minn./Twin City Twisters; Elizabeth Price, Coopersburg, Pa./Parkettes; Kyla Ross, Aliso Viejo, Calif./Gym-Max; MyKayla Skinner, Gilbert, Ariz./Desert Lights; Abigail Milliet of Denton, Texas/Denton Gymnastics Academy, and Madison Desch of Lenexa, Kan./GAGE. This year’s World Championships are all about the individual. Four girls can be sent to the championships. Three girls can go up on each event. Two girls per country can qualify to the All-Around finals and each Event Final. So we start picking our US Worlds team with the all-arounders. This year, those two girls are very clear. With Lexie Priessman and Katelyn Ohashi out with injuries, Simone Biles and Kyla Ross are really the only two in the running. The two of them are a lock unless they get injured. After the all arounders, you can add one other person to each event. The next obvious person is McKayla Maroney. McKayla won floor and vault at the national championships, and most definitely has the ability to qualify for the Event Finals in each of these events. That only leaves a spot for a bars/beam specialist to be added to the team. And there really aren’t a lot of girls that could qualify for the spot. 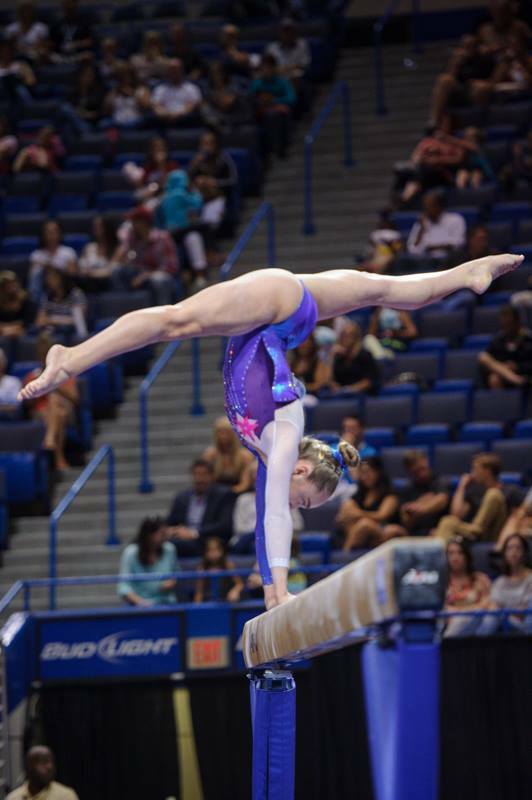 Madison Kocian made a case for herself hands down as a bars/beam specialist in the first day of Nationals. She had the second highest score of the competition on bars (15.0) and the third highest beam score (14.9). But her ankle sprain has led to her declining her invitation to the World Championship selection team camp. There are only two other girls who can make a case for this spot. The first is Peyton Ernst. Peyton scored a 14.6 and a 13.85 on bars and a 13.7 and 14.9 on beam. The next is Brenna Dowell. Brenna scored a 14.5 and a 14.35 on bars and 13.75 and a 13.85. Peyton had a fall on beam at nationals, but is definitely one of our top beam workers. She also has a style that is more popular in international competitions. If Brenna is able to make her upgrades on bars consistently, that would put her in a better place. Both girls are also strong all arounders, and would be able to compete all around if another girl was injured. Currently my prediction is that Marta will take Peyton for beam and bars, and Brenna as the alternate. There was a definite difference between the energy and the crowd during prelims than during finals. Walking into the arena, the air was filled with excitement and cheering. The view from my seat this time was beam! Which always makes me happy. I was also sitting behind Al, Tim and Nastia so I could see what they were broadcasting as well as what was live. And then before the meet started, I had my biggest fangirl moment of the meet. I looked up from my seat and who was standing there but my very favorite gymnast, Laurie Hernandez! Laurie built quite a name for herself- and quite a fan base- at this championship, so lots of little girls kept coming up to her. And yup, you guessed it, I joined in. Twice, because my first photo with her was blurry. It is easy to forget just how young these girls are. But like any normal pre-teen, Laurie just wanted her friends around. She eventually gathered a whole little group of juniors to sit with her. They cheered for the seniors, got ice cream, and just enjoyed themselves. The best moment was when Laurie found out that they were showing her floor routine on the NBC broadcast. She got her OMG face on and fanned herself. Oh how I hope the pressures of the spotlight don’t diminish her delightful personality from shining through! Throughout the meet girls in the stands were competing as intensely as the girls on the floor. Their goal? Waves from Jordyn, Aly or Gabby when they screamed “We love you [insert name].” There were also fun moments when they brought gymnasts out on the floor and Aly, Gabby or Jordyn would surprise them. Oh! And when John Macready had a contest where a two dads raced down the vault runway with their daughters on their back. They were big dudes and they bowled John over. Apart from all the shenanigans, my favorite part of watching the championships live (apart from the obvious gymnastics part) is seeing the girls and their families. Remembering how much all the family members have sacrificed to get them there. How the experience bonds them together. Even with the dramatic ending of Simone missing on bars, the mood and atmosphere in the arena was distinctly celebratory. Celebrating 50 years of gymnastics just brought such an appreciation of the support, of all the champions in the room and of the incredible privilege it is that we all get to be a part of it. With such a small field, we were able to see each and every gymnast compete at this senior national championships. This was such a treat! Here are all the national champions, the best routines on each event, and your new national team. 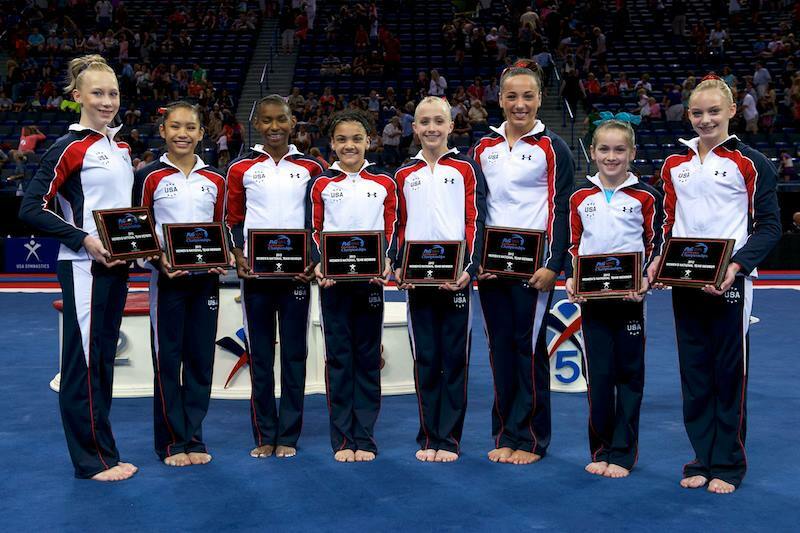 All photos and videos are from USA Gymnastics. 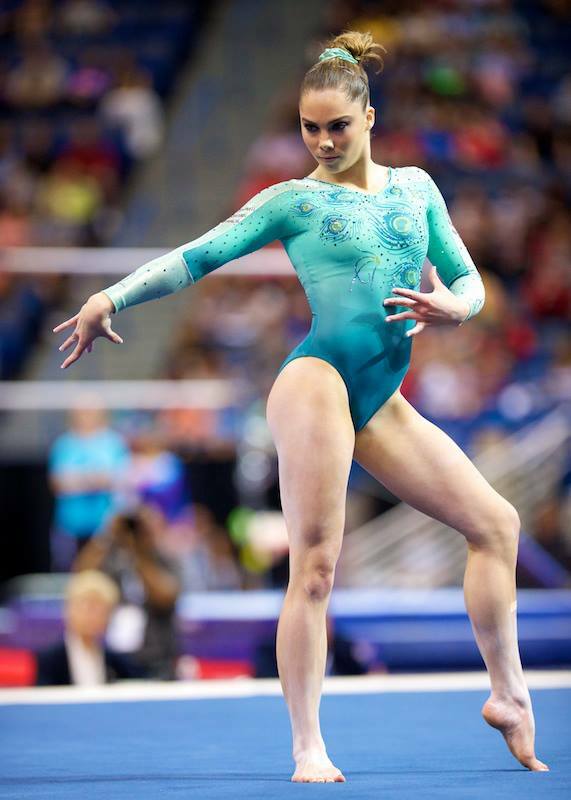 Without a doubt, McKayla’s amanar on day 2 was the highlight of vault. A 9.7 execution score for a 16.0. Kyla’s routine the first night scored the highest of the meet, a 15.5. Her bars are just breathtaking. Kyla Ross needed a 15.45 to tie Simone in the final routine of the night. A big wobble kept her from it, but she still put up an awesome 15.2. I walked into the arena and was immediately struck with how different the atmosphere was from last year. Last year at Nationals, the air was electric with the tension, nerves and excitement of an Olympic year. This year felt so relaxed and laid back in comparison. I took my seat next to an older African American gentleman. He was really nice and as we chatted I asked what had brought him. He said he was Kyla Ross’s grandpa! Turns out I was sitting near a few family members. Kyla’s uncle was there, and we were sitting behind Mike and Erin Maroney. And then I had a celebrity sighting…. Tarynn Maroney! Tarynn is McKayla’s little sister… she is without a doubt going to be a star and is so incredibly cute. Anyone who follows McKayla on twitter is treated to a bunch of adorable pictures of Tarynn and the sweet relationship between them. Erin was playing on her iphone with one of those cute brass rings case. We had a fun little chat about it. Mike’s face lit up when I gushed about how cute Tarynn was and how much I loved her on twitter. But the highlight of my evening was watching Kyla’s proud grandpa cheer her on and bringing him up to speed on some of the intricacies of gymnastics. I sent a tweet for him wishing her luck. 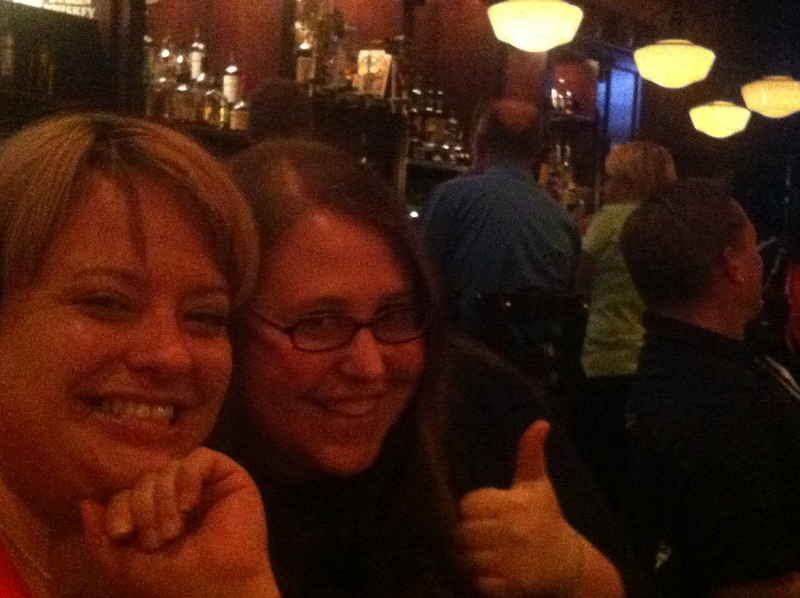 After the competition, I went with @lchops96, @jennifercarolyn and @SpannyTampson to a fun little Irish Pub for dinner. 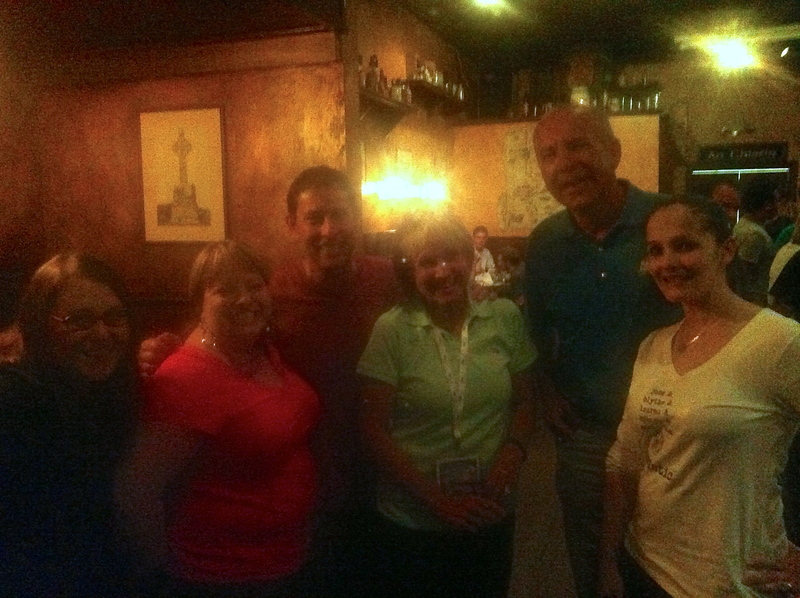 And after a while, who did we spot, but Al Trautwig and Andrea Joyce! And after a bit, Tim Daggett joined them. We tried to subtly take pictures by pretending to be taking pictures of each other. Which made us laugh a lot. As dinner wrapped up, I decided that I am way too old to be fangirling. So on our way out I asked them for a picture. I told them we were gymnastics bloggers and Al said “Oh no, you are going to use this picture to say this is the idiot (or something like that) that I always tell you about.” Tim had been on a podcast with Spanny and had to go to great lengths to explain what a podcast was to Andrea. After the pic, Tim and Al politely went back to their group, but Andrea stayed for a short but hilarious conversation. We were talking about how Kyla has grown up so much and she was reliving an interview when Kyla was a junior – complete with a Marta impersonation and a discourse on vitamix. She was so much fun! Today I am looking forward to the 50th celebration and the induction of the Fierce Five into the Hall of Fame. Oh yeah, and some more incredible gymnastics! Madison Kocian put on quite a show in the first two rotations of the P&G National Gymnastics Championships prelims. She lead the first two rounds of competition with beautiful performances on beam and bars. And at the end of the day, she ended up in second place to Simone Biles on beam (beating Kyla Ross) and second to Kyla Ross on bars. Though beam and bars are definitely her strong events, Madison continued to look great in her floor routine. On her third pass, she most obviously hurt herself. For a split second, I thought it was a repeat of Georgia Rose at the Pacific Rims. In the moment, the landing on her third pass looked pretty bad, and I fully expected a broken ankle. I was shocked when she continued on, and tentatively landed her final pass. It was such a courageous routine. After the routine was over, her coach worked on her ankles, and she was surrounded by medical staff. Rumors later in the evening placed her in an aircast. And today, USA Gymnastics announced that she would not be competing in the Finals on Saturday. 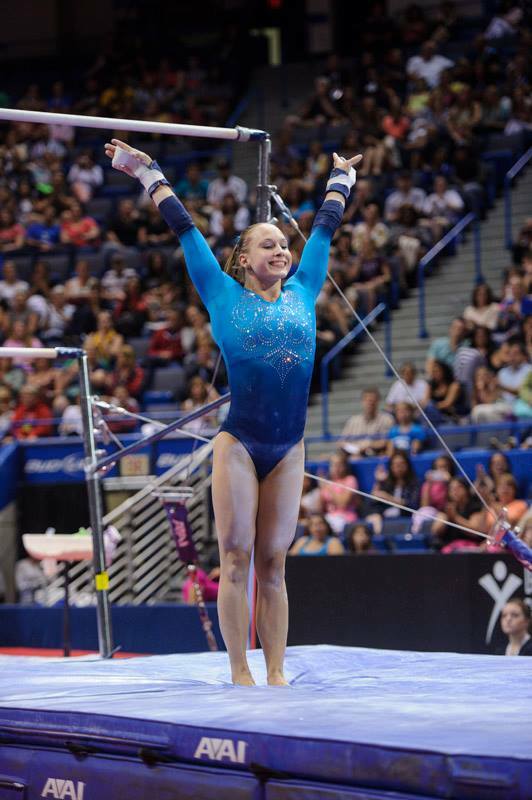 Madison Kocian of Dallas/WOGA has withdrawn from the second day of women’s competition at the 2013 P&G Gymnastics Championships. She suffered a third degree sprain on her left ankle during the floor exercise competition last evening. Sad to see her out of the competition, but this is definitely not the last time we will be hearing her name. Hands down, you simply don’t want to miss floor. In the senior ranks, you will see some incredibly difficult tumbling from a number of gymnasts. In the juniors you will see so many girls who can REALLY perform. But here are a few to make sure you don’t miss. Without a doubt, this is THE routine of all routines that you just have to see. She brings a creative, fresh approach to choreography, dances her heart out, and does so great tumbling to boot. This little girl can put on a show. She may just grow up to be on Broadway if gymnastics doesn’t pan out. Don’t miss her! Powerful tumbling, high energy and a more mature routine than we have seen Lexie do. In fact, it could make quite a good college routine. Except that it has some of the most difficult, high flying, excellently executed tumbling in the world! Kyla has put in some major work on dance, and boy does it show. Her clean lines, long legs, and beautiful body shapes make watching her such a relaxing, enjoyable experience. And now that she is performing with spirit, musicality, and beautiful dance, her routine is a must see. 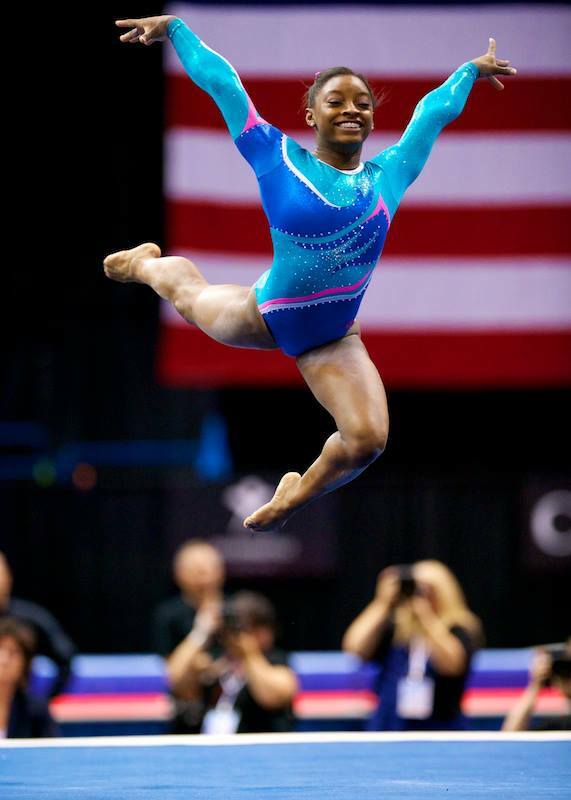 Simone seriously has springs in her legs. The air time she catches is just awe inspiring. She has a fun, dancy routine, but the highlight is her sky-high, world class tumbling. Nia brings in interesting and unique choreography while performing incredibly difficult, powerful tumbling. Her routine is one of a kind. Norah is a first year elite, but the gymnastics community has been waiting for her senior debut for years, predominantly because of her incredible beam work. Coached by Chow, many people think of her as a little Shawn Johnson. But the similarity is mostly in their training, form and work ethic. This is one of the top routines to watch! Bailie brings beautiful presentation, a calm and confident flow and difficulty to her beam work. Another junior, she is one to watch! Kylas beam always looks as if she is competing on clouds. Light, airy and yet incredibly solid, her exquisite work on beam is always wonderful to watch. She is supposed to be debuting new upgrades at nationals, so here’s hoping! Peyton has an elegance and grace that brings great beauty to her difficult beam routine. Abigail brings in lots of difficulty, with a beautiful and flowing style. She is beautiful to watch on beam.